Ah, September and Fall – my favourite time of the year. Of course in Central Texas, that means lower ’90s, but I’ll take what I can get. Today is exceptionally beautiful. 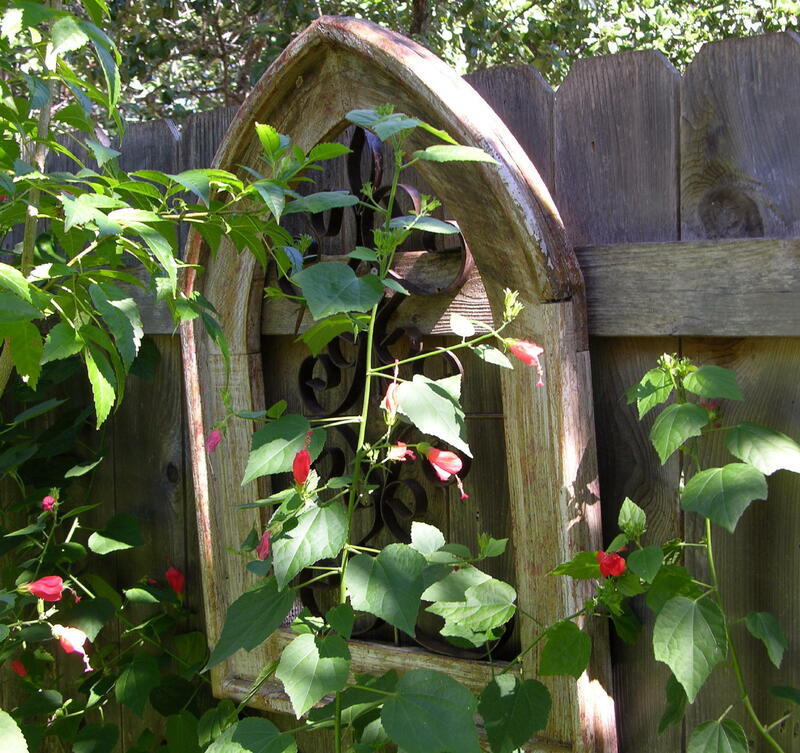 After Friday’s rain – between five and seven inches…woo hoo! and Saturday’s transition, today turned out to be clear and fine. And I love September light; more golden and heavy dappled through the elm tree. The humming birds are still around, but will probably take off in the next couple of weeks. The blue jays are more active – and more screechy…another Fall sound. More owl activity at night, too. 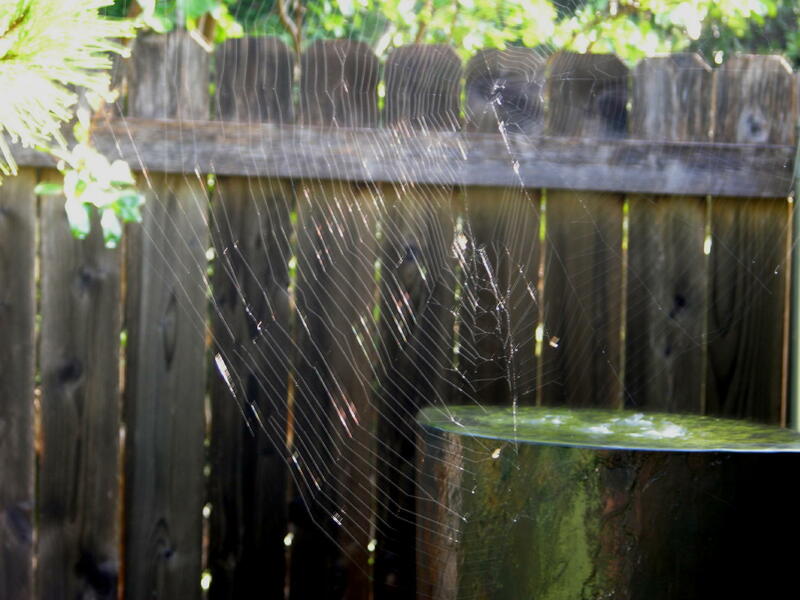 A gigantic spider web I found one morning – still amazed by the engineering feat. 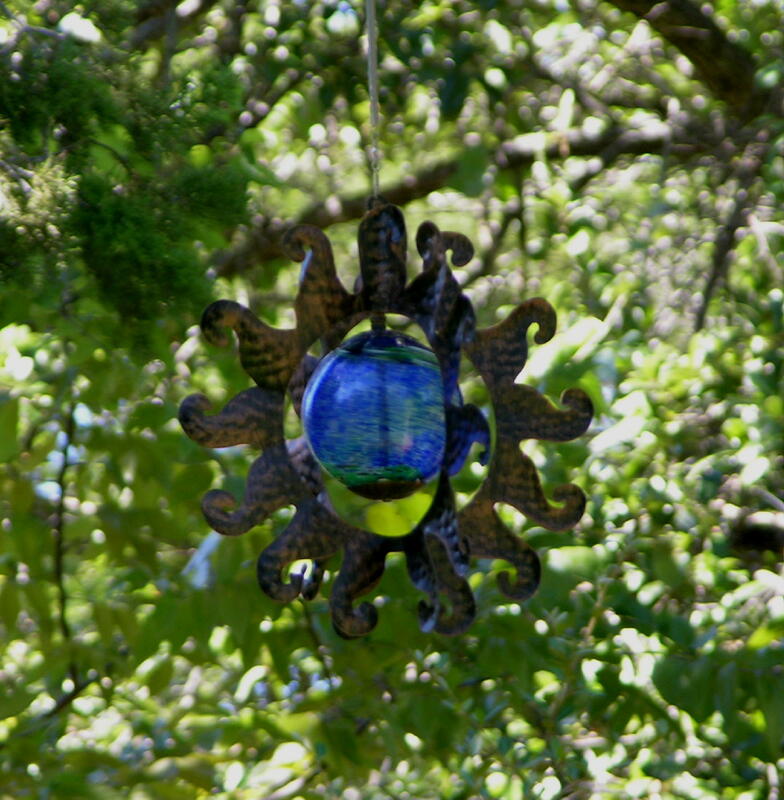 My newest tchotchke – a hanging glass sphere I got at The Natural Gardener. 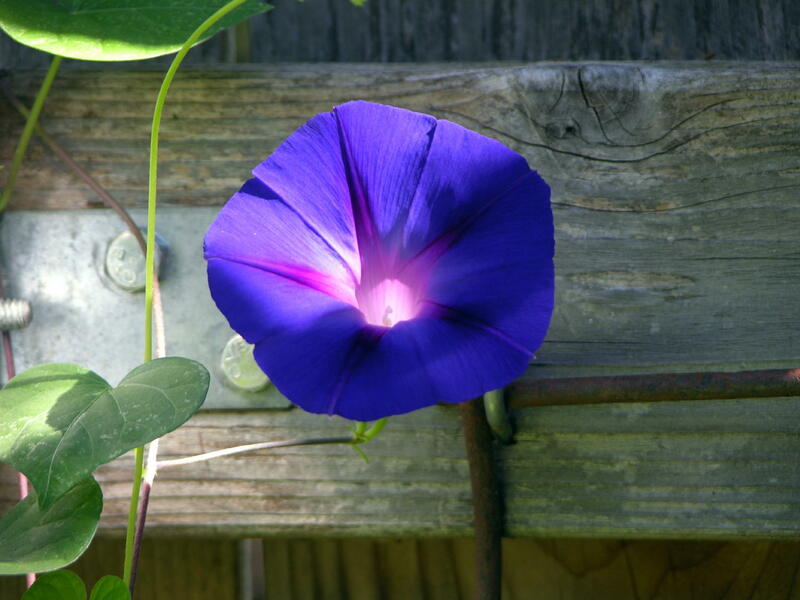 The morning glories are coming back to life. 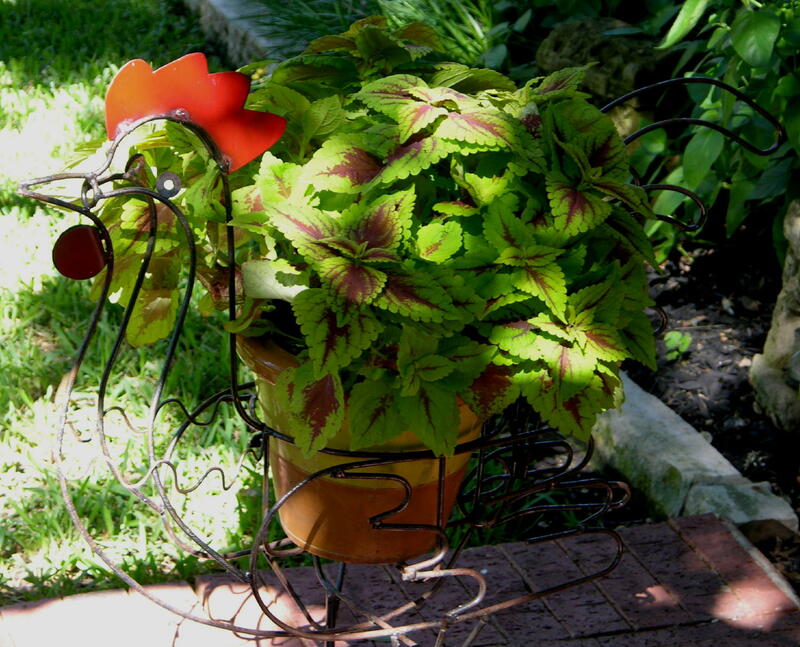 I put out my Fall garden decorations. 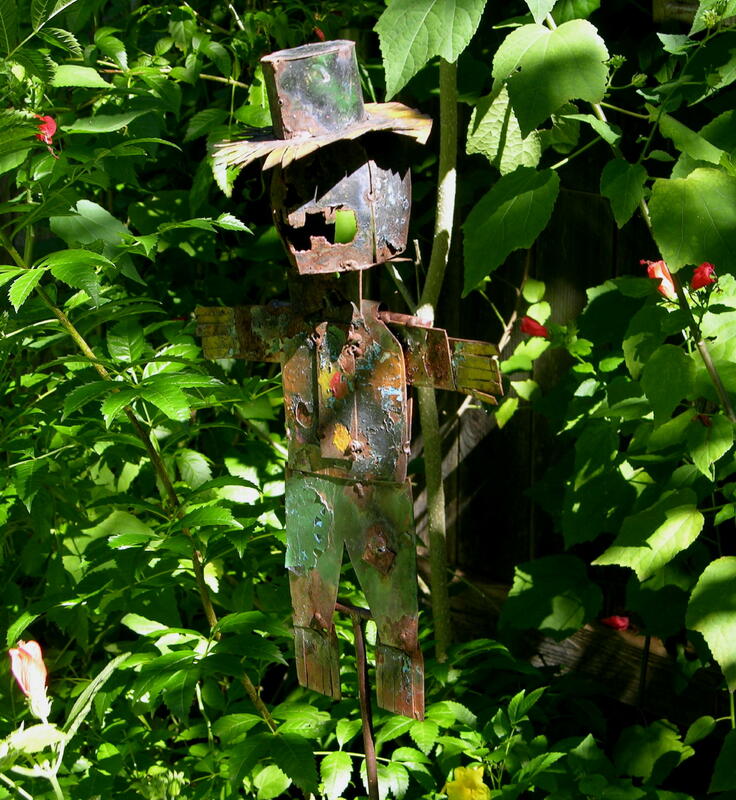 I love this scrap-metal scare crow – a tea light goes in its head. 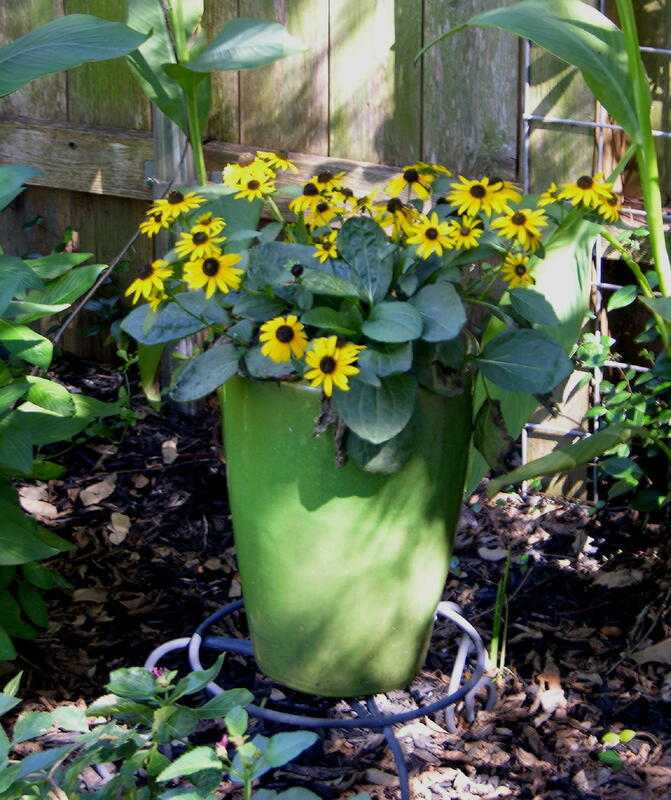 The black-eyed Susans still going strong. And the Turk’s Caps, too. 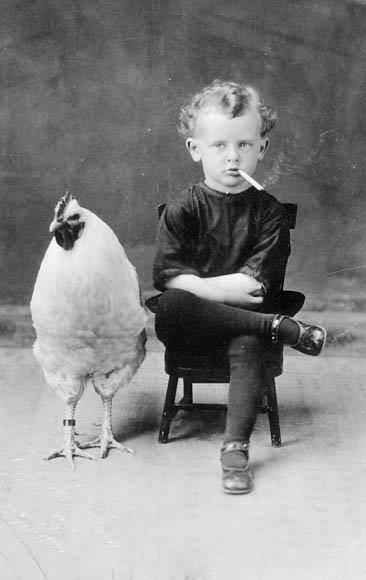 This really just defies description, doesn’t it? 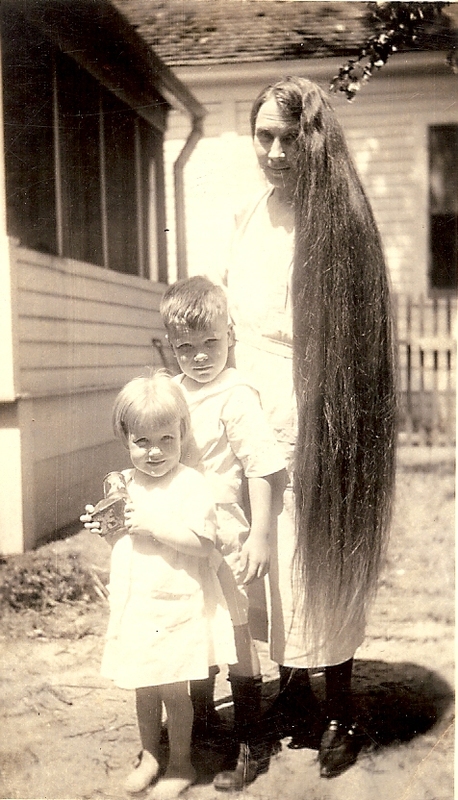 But it prompted me to go through my family album to see if I had anything similar. The following is my gallery of ignominy. 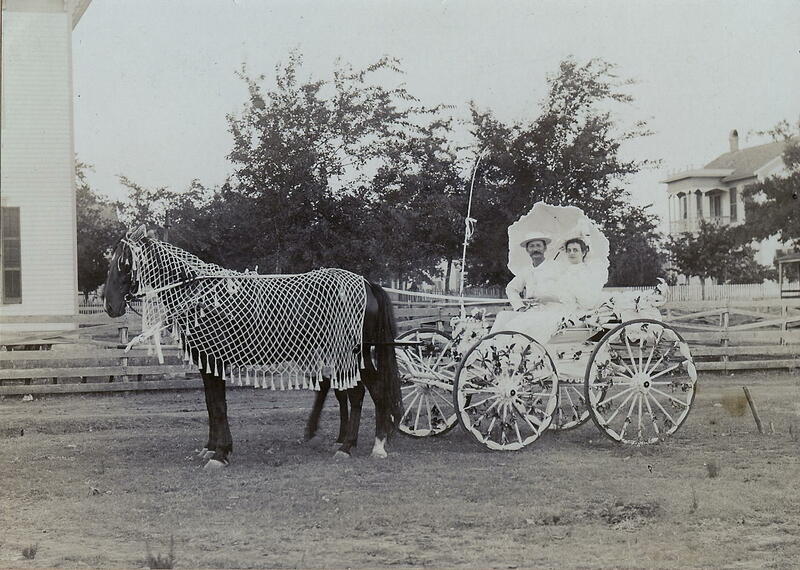 A photo of Ed Arnim and ‘Miss Paula’ (Paula Marberger Arnim) with a horse wearing a macramé blanket, taken by Moses Cadwell. 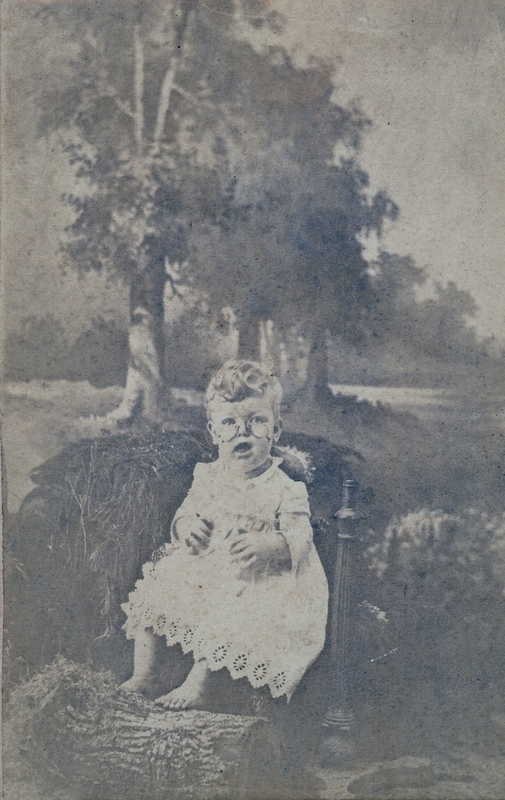 My great grandfather, Hugh Brunnemann on his first birthday, wearing his father’s spectacles. 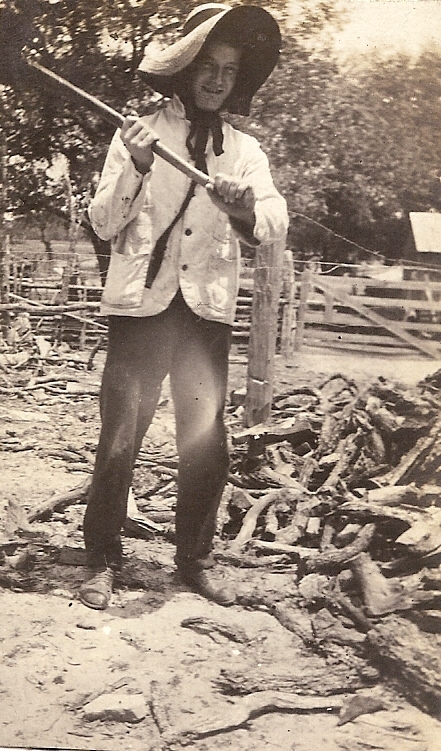 My great grandfather, Hugh Brunnemann, in a huge hat, next to an oak stump. 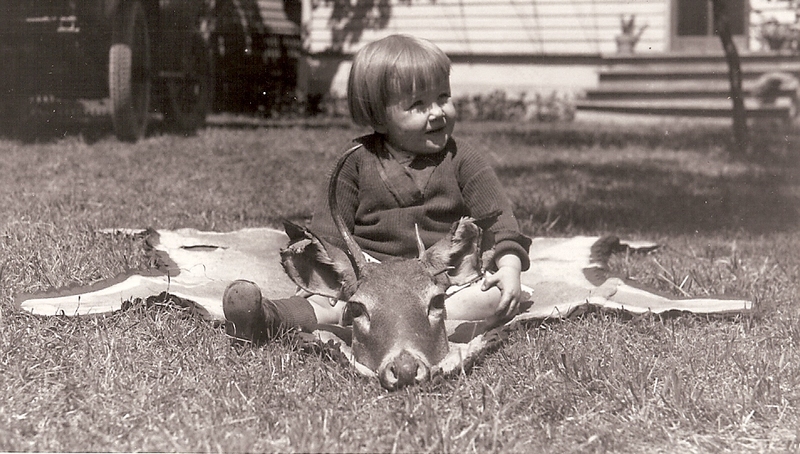 This is my grandmother sitting on a dead animal pelt. 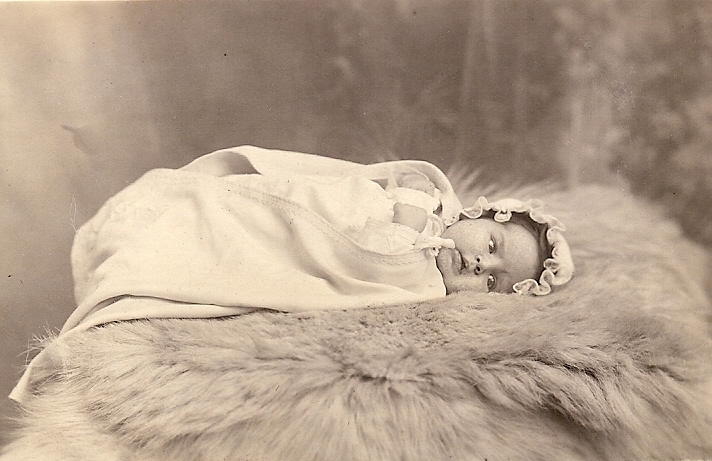 My great grandfather, Hugh, followed in his uncles’ footsteps with a life-long interest in photography. Here are some of his more ‘interesting’ results. 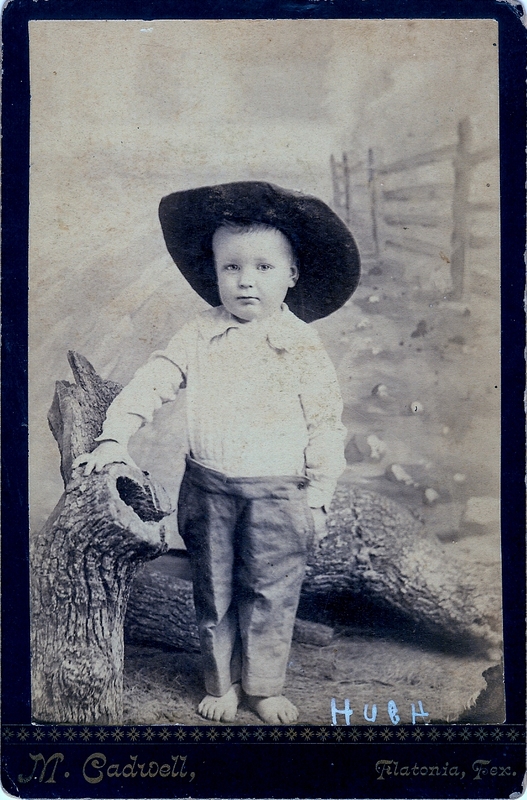 This is my great grandfather about 1914 near McAllen, Texas. 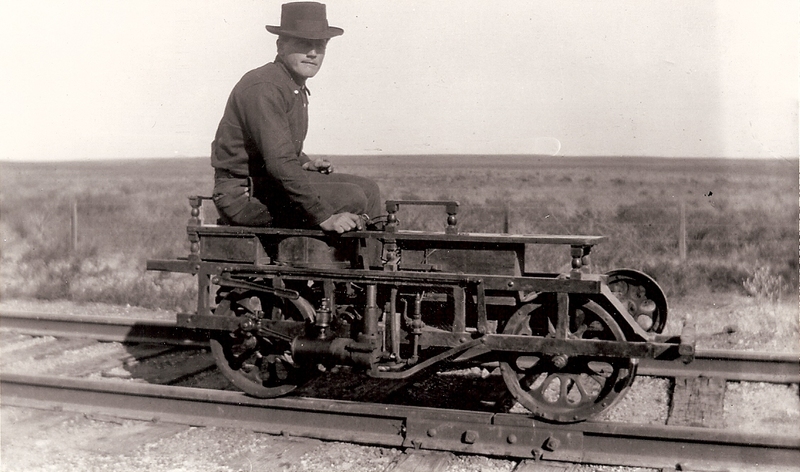 I can’t imagine how you rode around on that bizarre little hand car. This is my great grandfather making a fashion statement. 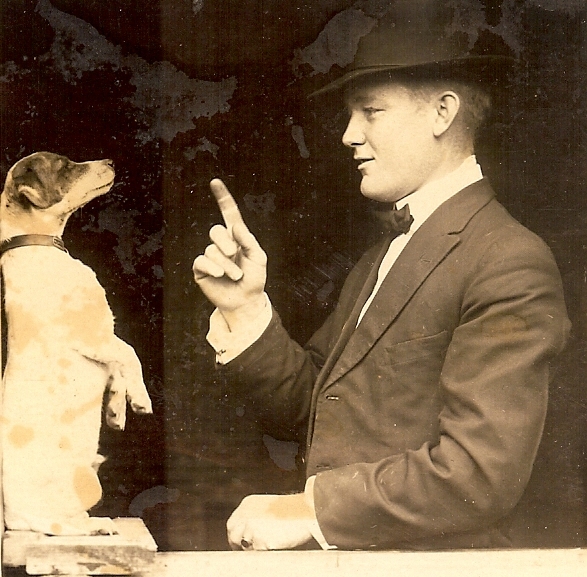 And finally, my great grandfather doing stupid pet tricks.